Our Anti-Spin overhaul kit contains all the necessary parts to rebuild a weak or slipping "posi". 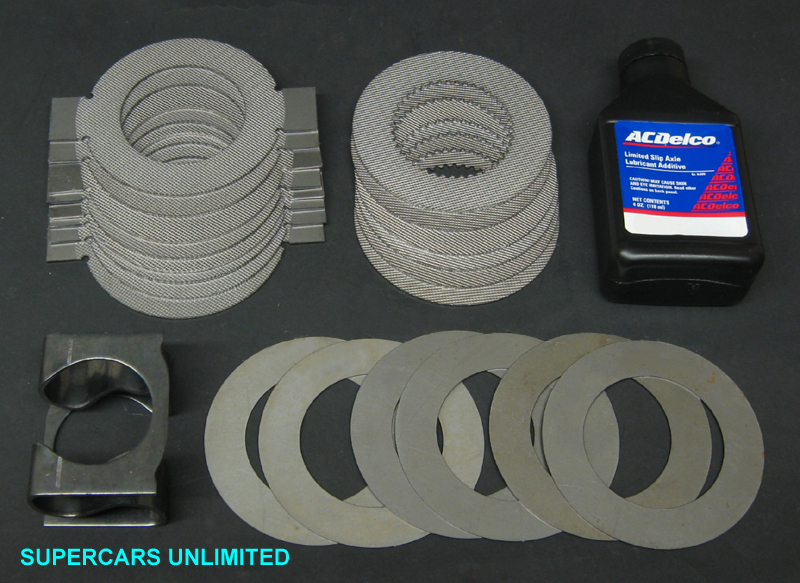 This kit also improves the effectiveness of the factory unit by using a stronger spring. While the original spring provided 200 psi of force, we provide a spring that increases the pressure to 300 psi. This stronger side pressure ensures both tires will provide equal traction even with slicks. Kit also includes both clutch packs, an assortment of clutch to case shims (required for proper setup) and a bottle of 46-066 additive. All components in our kit are Made in the USA! Provided the old clutches are not burnt or have excessive wear, often a weak Anti-Spin ("posi") can be re-shimmed back to within factory tolerances. For those not needing new clutches, our spring and shim kit can be used to shim your used clutch packs back to factory specs. Kit includes correct size O axle shims (2 each .005 and .007), our improved 300 pound "S" spring (original was 200 psi) and a bottle of 46-066 GM additive. For use with all 1967-1972 10 or 12 bolt O axles with Anti-Spin. Clutch kit for rebuilding our 46-146, 46-148, 46-150, 46-198 and 46-200 12 Bolt O axle differentials.